The I.D.C.-Bornu Groundnut Lifter was originally developed in a joint USAID/Ministry of Agriculture project at Maiduguri for the savanna area of northern Nigeria, This tool was later introduced by the l.D.C.-Zaria for manufacture by local blacksmiths, and it was more recently adapted for local manufacture at the I.T.D.G. Project at Magoye, Zambia. The lifters have no sifting tines but were designed spe cifically for groundnut raising (peanuts and legumes). Intermedia te Technology Publications, Ltd.* 9 King St.
this digger is attached to a multipurpose main body. 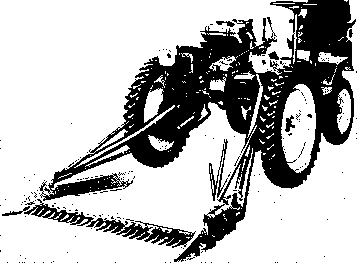 Other attachments include a hoe and ridger. The digging element weighs 37.5 pounds, the forecarriage 55.2 pounds. There is a choice of a single or double handle, made to order. 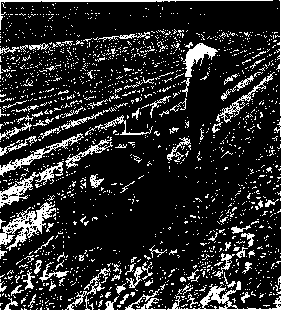 AEBI offers a potato digger with a longsifting provision for rooting out potatoes and leaving them piled on top of the soil in a neat row. It is adapted for operation on a 35-percent slope. 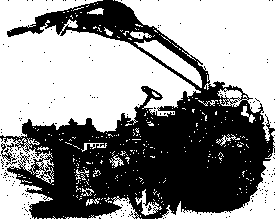 ( AEBI Potato Harvester ' AEBI and Co.